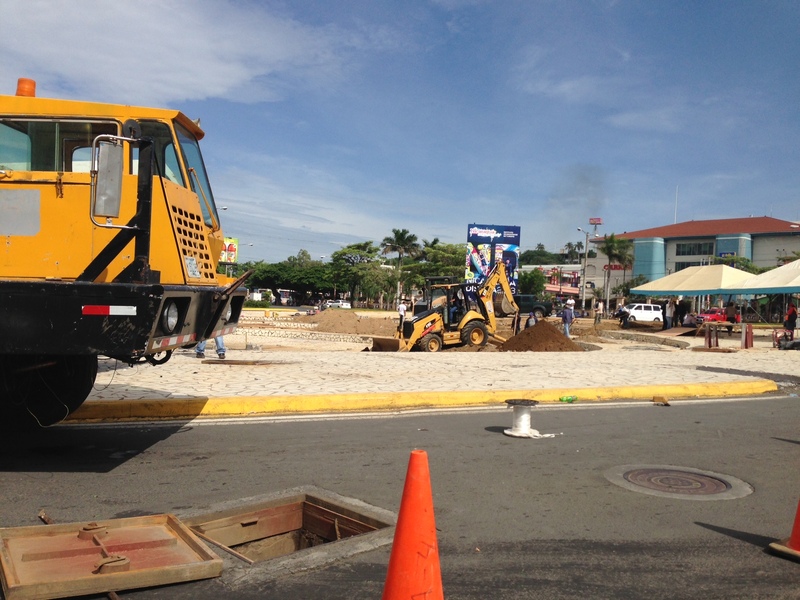 in the still of the night on july 21 2013 the fountain was torn down. no prior notice given. the government had not maintained the fountain for eight years and everything that could be stolen or broken was enacted. a programed neglect to destroy, marked for death, since many rotundas have been restored by the present government. 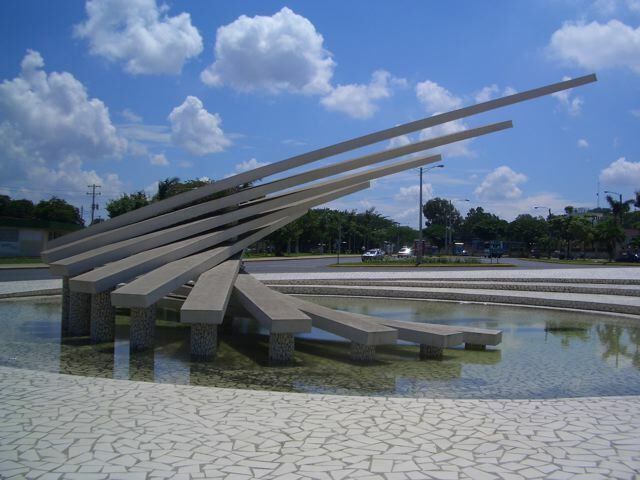 herty lewites the popular former mayor of managua and opposition candidate for presidency at time of his death was my client and responsible for this fountain for the people. there would have been opposition to the destruction, because the backers of herty lewites had renamed the fountain the herty lewites rotunda. venezuela, the oil provider needed a sacrifice. nothing personal, just politics. 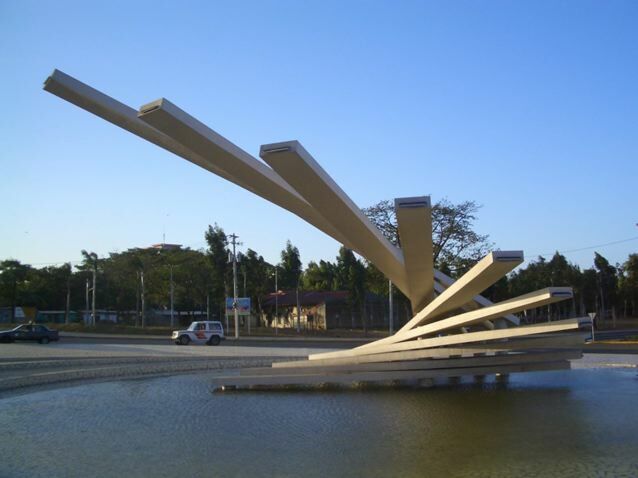 rosario murillo, the president’s wife waved her wand of death and the fountain was gone and the hugo chavez political sign board was erected. what a sad statement of destroying a delightful monument. when built in 2004 (see blog NICARAGUA 4 smallatlarge.com, ) and years after every time i drove around the fountain i was stimulated by the in motion visual excitement. the high point being when the people gathered at night with their friends and kids sitting on the terraced seating. everybody getting a cool blast of air and a visual turn on. 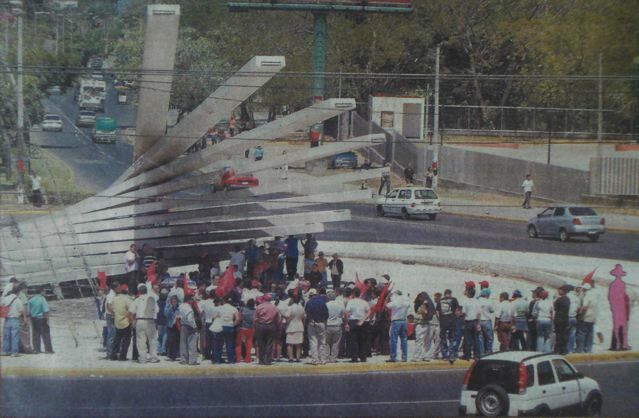 a popular stop for demonstrations, the activists running out to the ends of the cantilevers. nobody fell to my knowledge. the fountain was herty lewites’ propaganda sign as well, but done as a gift to the populous. a thing of beauty, to be cherished and maintained to last forever. the construction fast and affordable, like a movie set, but meant to be maintained and respected. fountains have moving parts that have to be cared for and guarded. all of which the present government is doing for other rotundas. i looking down last spring from a plane at night, seeing the dynamic glowing plan twisting into the fabric of the city, i contemplated the significance of the north south axis that the colon fountain reinforced. stating my interest last spring, at an architectural conference MUNDANEUM in granada , of restoration of the fountain. a powerful business man backer come forward to say he would put together a group to preserve the fountain. i do not know whether he tried, but the government was dead set to destroy the fountain forever. 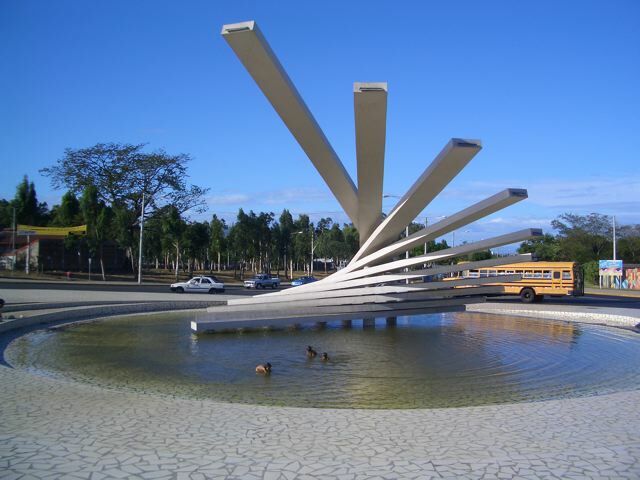 a couple of other architects at the conference commented on taking pictures of the dynamic fountain in their tour on nicaragua before i met them. the pictures are shown in pairs at different views around the rotunda. 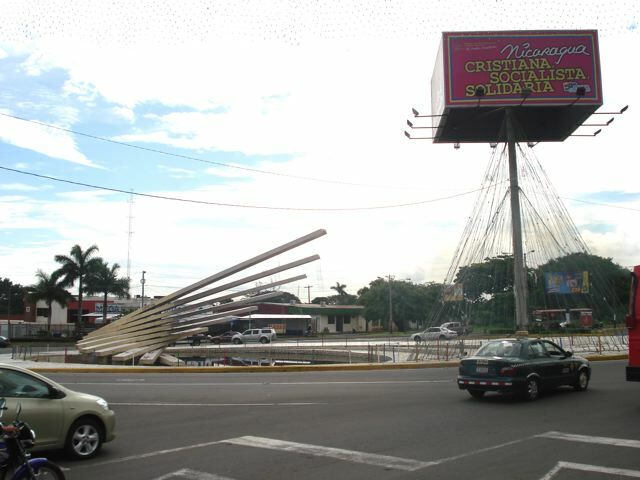 first pictures the implemented original fountain the second picture the chavez sign board replacement. 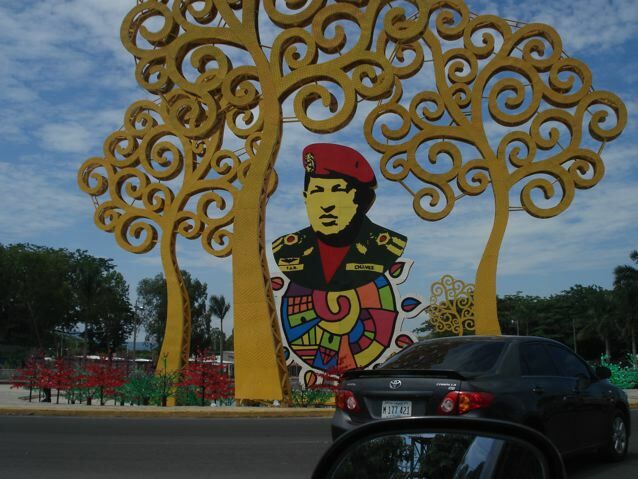 the government hugo chavez rotunda having weird steel yellow cartoon trees and small plastic trees sprayed different colors. 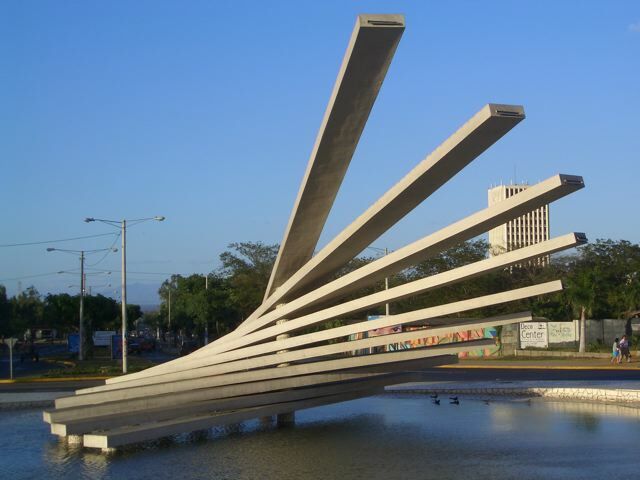 my structural engineer of my other projects, saying that the local architects thought the fountain was the best of the monuments i had designed for managua. roger lewites, my former sci-arc student and i were the architects, , kaun lee the structural engineer. i nor roger never were consulted by the present governmental regime for consultation concerning our government projects. there is also the unwritten ethical code of architects contacting original architects about remodels. never hear a peep from the professionals involved. the terraced base and pond was kept, although for years the pond was criticized for mosquito haven as a failure of the fountain. what would you expect with the filter pump turned off? rosario murillo has plopped down these steel trees of life and woven lights into them to get the most bang for the buck. she has proceeded to put these trees everywhere throughout nicaragua. the newspapers, recently stating the government planning on putting them in every rotunda in nicaragua. talk about political symbolic propaganda, this out stamps any campaign i have witnessed or read about. 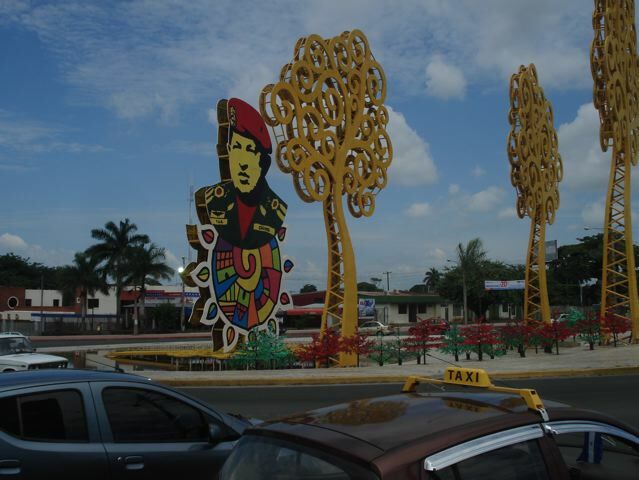 nicaragua is famous for its natural beautiful trees, rosario could have easily gone green, and left something for posterity when her reign was over. just another example of change for the worst. common in history, but personal to me. so be it. you be the judge. you nor the people of nicaragua were given the opportunity to influence history. my gift to nicaragua to uplift the spirit of the populous. for me there was no politics, just designing and building to make people happy and enriched. seeking universal beauty, which was achieved. a brief life ending in tragedy. 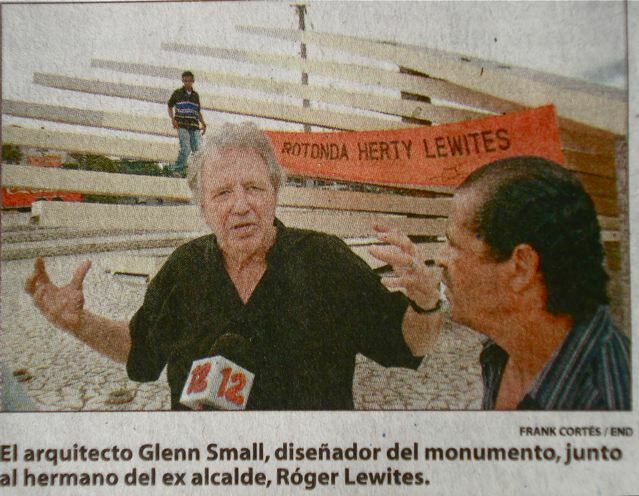 demonstration for herty lewites rotunda 2009 la prensa newspaper , roger and i trying to rally a save, but when you are up against governmental power in nicaragua, a blurb in the newspaper and a bit of tv coverage is a minor bleep on the radar screen. Glen, you got punched right on the nose with this. I know it hurts, you told me. An d by the way this is not anti-modernist, or peoples art replacing ‘elitist’ art. This is purely and solely a political action of removing the signs the memory of a political rival, Stalinist would be the accurate description. The opposite of freedom, the censure of debate, or symbol of that. Stalin ‘erased’ persons from photographs, erased memories. There are other examples in history about ‘erasing’ things from from memory. erasure comes in lots of forms. Books burned Entire libraries destroyed so a peoples history is erased forever. Genocides, seizures of property, disqualification, exile. What is left is human memory and if that can be wiped out so the better. PROVE to me that happened ? thet would say. There is no evidence anymore. survived. Saved by a writer. Glen I am glad that you are doing your blog. And saving memory. I am glad I am a writer too, saving memories, bringing up Glen Small’s role at SCI-Arc, the Green movement, the work. Not to be missed, not to be erased. i never thought of myself as elite, but instead giving the people something they would enjoy. that was the emphasis behind all the projects i did for herty lewites. i know the past has to be destroyed if it conflicts with the present. in this case the fountain had no personal representation, just form. all the more powerful to rally around. Glen ‘elitist’ is in quotes. ie within the socialist realist aesthetic all abstract art, architecture is considered ‘elitist’. That is above the peoples grasp. Two problems with that approach. First it assumes stupidity of the masses by the ruling powers, dumb it down, keep it simple cartoon style. Give ’em slogans, not anything to think about. second. Simple shapes, primary forms, geometric progression can be understood by anyone even a child. These shapes are universal and not ‘elitist’. Nature in her simple complexities reveals all to those who look. It may be the active act of contemplation that put fear into government that puts up cartoon cutouts like advertisements or brands. Totally cynical on their part. Greetings my dear Glen. Well what can I say? What could you wait from a government like this? Despising what ever remind them what it cloud have been their politic end. 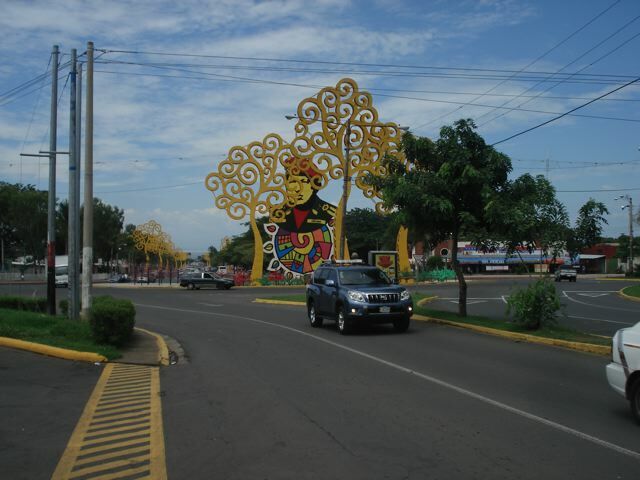 I hope one day my Nicaragua come back what it used to be; a progressive nation. Like my dad says; Sandinistas turned Nicaragua into a poor an retarded country in the 80’s . Never in history we had fallen to the poverty and delay that we are now even close to Haiti level. God has mercy of Nicaragua. yes, the poverty is a shame, but the usa had a lot to do with destroying the economy. herty lewites , besides being a man for the people, understood economics , peace, and how to improve things. he had vision of how to improve nicaragua for everyone. This will be a bit off-topic. I want to discuss the Shapes that Glen uses to make his Forms. First I make the distinction between shapes, the parts, and the overall form. The shapes, an inventory I mentioned before, tend to be arcs curves spirals and characterized by roundness. The shapes combine in part to what Small describes as sensuous forms. Many persons have suggested that the vocabulary is Bauhaus/ constructivist derived akin to functionalism. other references are to 50’s Googie-style reworkings of constructivism like coffee houses and position Small within that revival. Not so. Glens inventory of spirals, arcs and curves derive from his examination of nature. things like shells. seedlings, plants, etc and not from art or Platonic ideas. 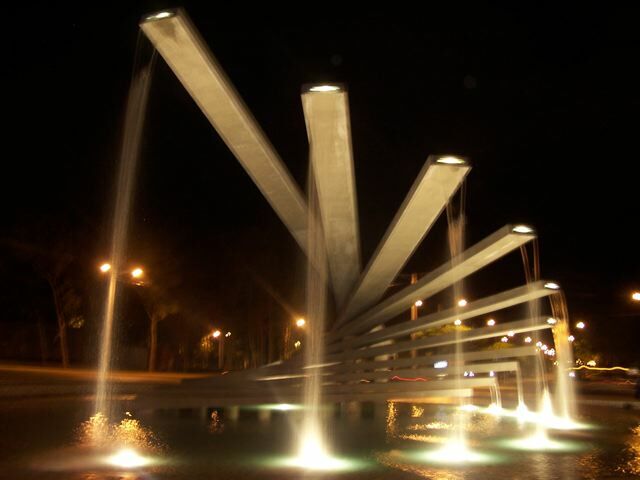 This fountain, (and the earlier SF fountain competition) are an examples of a nature derived shape, something you would observe in the pattern of plant growth,. The stepping spiral-growth pattern of leave stems spreading outward from a central stem. This is the organic part, the nature derived aspect of the form. Not a mimic, but a pattern. This is an example of art deriving shape from nature. all you say in true. said in a way that only you, the genius with words connected to insight, can do. literal interpretation of nature is not what i do. in this case of the fountain it was taking some strips of mat board and twisting them on a point. all the pipes and electrical lines come up the center column and dance at the ends of the projections. it is true i stare at the way plants peal off a trunk . in the tropics this is a common growing and structural pattern. i get irratated when the form of a buiding is applied decoration, it loses the power of form and fuction combinned. a given with nature. 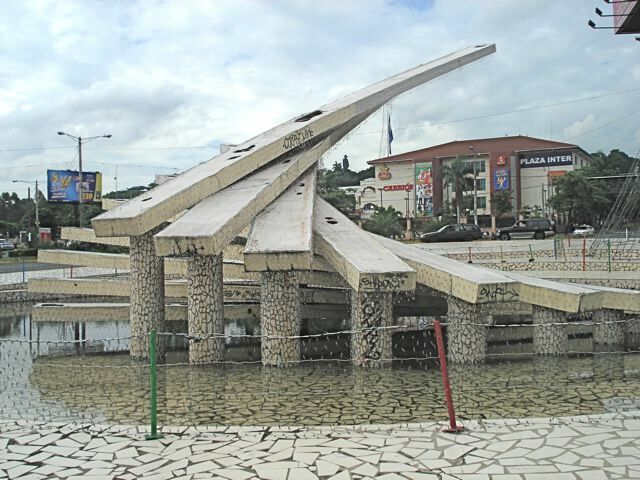 i just went back and looked at the original pictures of the fountain and got furious about the destruction. what a blatant shame. True, the spiral and the helix can be thought of as a mathematical sequence in space, Same for serpentine wiggles and arcs and curves. On the whole. looking at the predominance of the choice of forms has me believe that the logic of math comes second to the logic seen in nature. the design was left over from the san francisco fountain. a superior design that was not built. in the san franciso scheme the planes were many more and wider so there was overlap that made the platforms structural. 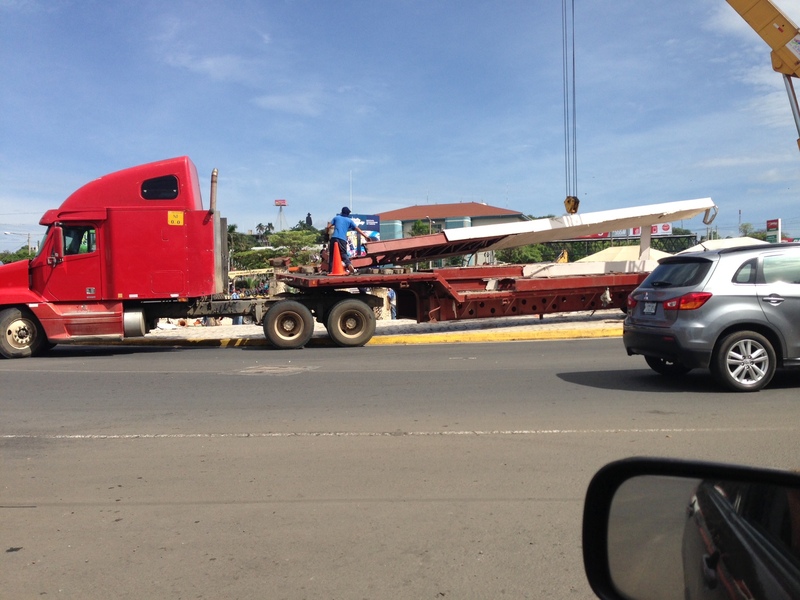 in nicaragua the planes were narrow and fewer. thus the structursl integriaty was challenged and the platforms ended up cantilevering on their own. the longer ones bending a bit, but structurally strong. mathamatics was not a tool other than the twisting was the same degree. there were computer calulations made, that when implimented in the field were wrong , so i did some shifting of things by having graduated secondary columns to correct the computer error. nature having to take a back seat on this design. The narrative-story, on this and on you, are the many metaphors of nature. An indirect, direct, implied, overt aesthetic that has its structural, visual look. shapes as parts and overall forms inspired, derived, analogy, to natural processes, organic things, life forces. It goes on of course. .
And of course engineering is involved. The day-to day dealings with architectural design, working out human and social interface with the architecture changes the ‘pure’ biology based forms into, well a building. Nature, the metaphor, steps back so the architecture can work. Otherwise, the work is conceptual. .
A building based on just mathematical sequences, or language games (ala Eisenman shifts and overlaps) , are just conceptual. A building that IS a tree or a plant, or is grown are also just conceptual. Or literal representations of theory. there is no question, that i look to nature for inspiration of my designs. the combination of function and form dominates. that is why i do not follow trends, but of late the profession is pattern design, which often is reflected in nature. but what i find stressful is that the patterns are tortured and hard to construct. yes they can be computer generated to make drawings for all the variety, but their systems are forced. modernism is back in all of its’ glory, because it is in the orthogonal world that is easy to construct. i do that with repetitious, constant radius, etc. to make the biomorphic systems build able.